The Original Aloha Shrimp Globe Habitat is a complete, self-contained and self-sustaining miniature world encased in glass. Inside each balanced habitat are active micro-organisms, two Aloha Shrimp, algae and bacteria, each existing in perfect harmony. *Future Globe Habitat Expansion: Maximum of 9 Aloha Shrimp for a healthy and happy ecosystem. Our Globe Habitats were custom made with handblown glass to resemble our world. 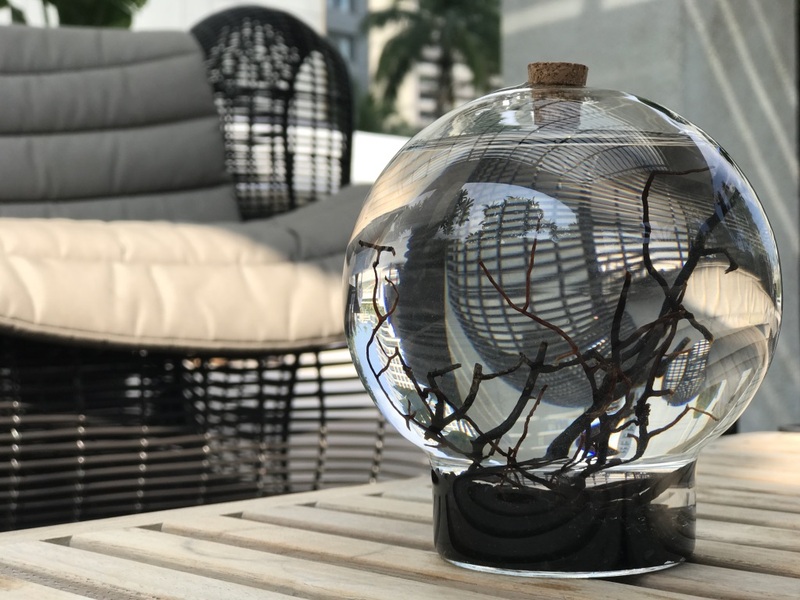 Replicating a miniature working model of the Earth, your new Globe Habitat contains the same essential elements that are found on our planet - Air, Water, Life (algae, microorganisms and two lucky Aloha Shrimps) and lastly Land (gravel). Life functions in your Globe Habitat just as it does on Earth. The perfect pet, your Aloha Shrimp require no feeding or water change. With proper care your Aloha Shrimp will have an average life expectancy of eight years. However, it is not uncommon for Aloha Shrimp to thrive in habitats as old as 20 years in the right environment. Inside each Aloha Shrimp Habitat are a balance of active micro-organisms, a pair of Aloha Shrimp, algae and bacteria, each existing in perfect harmony. Easy to care for, Aloha Shrimp is an incredible learning tool that can provide powerful insights about life on our own planet and the natural cycle of resources. Included for a limited time - is a complementary 30ml bottle of B-Water Complex Supplement, to keep your Aloha Shrimp happy and healthy for your first year. Simply add 1-3 drops to the water once a week. For Aloha Shrimp Care click HERE. CAUTION: Be wary of inferior and lower quality imitations, as this can lead to unbalanced habitats and unhealthy shrimp. Please do not use water other than Habitat Water or B-Water Complex Supplement as this may result in sick Aloha Shrimp, or death. Please note that the size and colour of the gravel and substrates listed can vary due to natural availability, and the resolution of your computer monitor.